Around 1600 athletes are already registered to participate in this year’s Lanzarote Ironman event on 25th May. The participants come from 50 countries, and numbers my push close to 2000 before the registration deadline. Most are from Spain, with British athletes being the second largest group currently. The entry costs €600, and there are prizes totalling $25,000, together with up to 40 places for the coveted world championships in Hawaii. The Cabildo have commissioned a feasibility study into harnessing the abundant waves off the north coast of Lanzarote to generate electricity, using wave generators submerged deep enough not to affect marine traffic, and sending the electricity generated to shore via a cable. Currently the technology is being tested in Wales in the UK, and Lanzarote will be used for phase two tests by the company Bombora Wave Power. Politicians from four of the island’s political parties, Podemos, PSOE, Ciudadanos and Somos have opposed the appointment of Kenneth Gasque and Liz and Larry Yaskiel as adopted sons of Lanzarote – an honorary appointment normally given for years of work to benefit the island. Kenneth, for many years a director at Club la Santa, is most well known for bringing the Ironman event to Lanzarote, and promoting it for over 30 years, while Liz and Larry produced the English version of Lancelot magazine. All three have contributed a great deal to their adopted home over many decades. 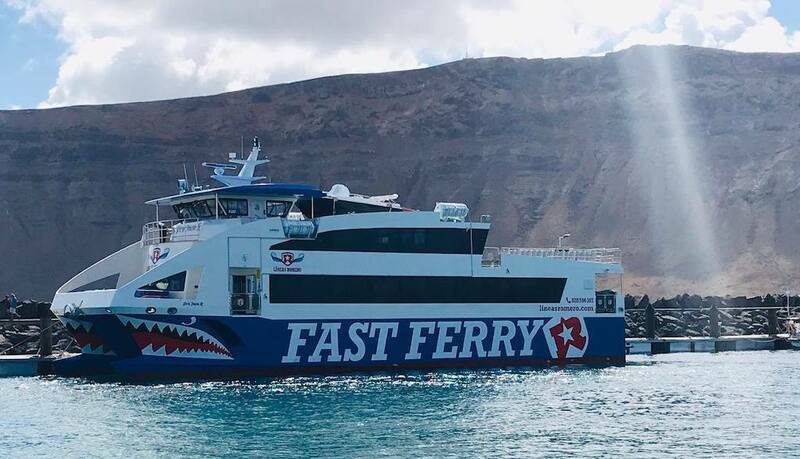 Lineas Romero have expanded their fleet by adding a high speed catamaran, Don Juan, onto the Playa Blanca – Corralejo route. Their current vessel takes 45 minutes to make the crossing, and Don Juan will do it in 30 minutes, allowing for 6 daily departures. The Lineas Romero vessels are for passengers only, not cars. Ryanair has released the summer flight schedule from Cesar Manrique Airport to the mainland, and they will be offering direct flights to Madrid, Sevilla, Santiago de Compostela and Valencia. They will no longer be flying to Barcelona, Zaragosa and Santander. Almost 10,000 cruise ship visitors were on the island on Thursday of this week, as three big ships docked in Arrecife. Several thousand went on excursions to various parts of the island, with many choosing to stroll the streets of the capital. A large group of crew chose to visit Lanzarote Karting. Lanzarote had the highest increase in visitors across the archipelago, with the total up 5.5% versus last year. The accumulated annual increase here over the first two months is 8.5%. The car maker has filmed a series of videos in La Geria as a celebration of 40 years since they launched the first G Wagen. The video shows the original G and the current version driving in the wine region. Villa 166 is fabulously appointed and features a goregous garden with private pool. It sleeps 8, and is ideal for extended family with a seperate apartment.